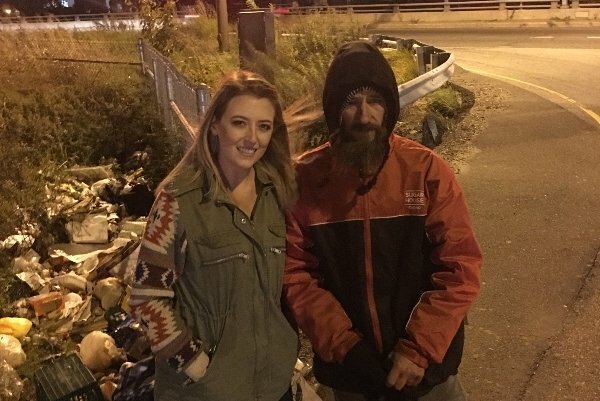 Nearly a year ago, the story of a homeless man helping a stranded young woman on I-95 went viral and raised over $400,000 in online donations. In a news conference Thursday, Burlington County Prosecutor Scott A. Coffina said the entire story was "predicated on a lie." Kate McClure and her boyfriend, Mark D'Amico, gained widespread attention when they launched a GoFundMe page for Johnny Bobbitt Jr., a homeless military veteran, last November, raising more than $400,000 to help him get his life back on track. The GoFundMe was created, McClure and D'Amico said at the time, to thank Bobbitt after he spent his last $20 on gas to rescue a stranded McClure. The investigation by the Burlington County Prosecutor’s office into the story of D’Amico, McClure, and Bobbitt involved poring through more than 60,000 text messages, Coffina said, but the damning evidence was sent in a text less than an hour after the GoFundMe campaign launched: A friend of D’Amico’s texted about the campaign and asked if it was made up. How easy is it to use a viral crowdfunding campaign to steal people's money? The prosecutor’s office discovered during its investigation that the trio had known each other for about a month before the campaign launched. Bobbitt often hung out at an underpass near the SugarHouse Casino in Fishtown, which Coffina said D’Amico and McClure often frequented. It’s believed the couple met Bobbitt while leaving the casino, and struck up a relationship from there. Where the three came up with the idea for the alleged scam isn’t entirely clear, but Coffina said the investigation turned up a story that Bobbitt posted on his personal Facebook page six years ago. It was a “remarkably similar story,” Coffina said, to the one Bobbitt peddled with D’Amico and McClure: a tale of Bobbitt using his last few dollars to help someone with gas money and a flat tire outside a North Carolina Walmart. “Damico, McClure, and Bobbitt conspired to pass off a fake feel-good story,” Coffina said Thursday. All three have been charged with second-degree theft by deception, and conspiracy to commit theft by deception. The charges carry a potential prison sentence of five to 10 years, Coffina said. D’Amico and McClure, who turned themselves in Wednesday, are scheduled to appear in court on Dec. 24. Bobbitt, who was arrested Wednesday night in Philadelphia by members of the U.S. Marshalls Fugitive Task Force, is in custody awaiting an extradition hearing. The prosecutor’s office revealed during the investigation that D’Amico and McClure had burned through their share of the money by the middle of March, buying a car, taking trips, purchasing high-end handbags and jewelry, and hitting casinos. They also used $9,000 to pay off debts to family members. Bobbitt received just $75,000 of the $367,000 made available to McClure and D’Amico after GoFundMe’s fees, and in August the situation devolved into a court battle for what he believed was his fair cut. At the same time, Coffina said, D’Amico and McClure were pursuing a book deal about their story which they believed could help their financial troubles after blowing through the windfall. When the story turned contentious, D’Amico apparently pitched the book title, “No Good Deed,” as one idea. Bobbitt’s decision to fight for his portion of the money, of course, is what helped lead to the trio’s downfall two and a half months later. If Bobbitt hadn’t made noise about not receiving his fair share of the money, could the three actually have gotten away with the ruse? Coffina said Thursday that GoFundMe told his office it will be providing a full refund to everyone who donated to the campaign. Continue reading below for more about about Kate McClure, Mark D'Amico, Johnny Bobbitt Jr. and their alleged GoFundMe hoax. This information was published earlier Thursday, prior to the Burlington County Prosecutor's Offices press briefing. Just a year after the story of a homeless man helping a stranded young woman on I-95 went viral, inspiring hundreds of thousands of dollars in donations from around the world, new allegations say the entire story was just a hoax. Kate McClure and her boyfriend, Mark D'Amico, gained widespread attention when they launched a GoFundMe page for Johnny Bobbitt, a homeless military veteran, last November, raising more than $400,000 to help him get his life back on track. The GoFundMe was created, McClure and D'Amico said at the time, to thank Bobbitt after he spent his last $20 on gas to rescue a stranded McClure. Charges filed against the couple and Bobbitt paint a different story, however. The three individuals are now accused of conspiring together to create the story as a ruse in order to make money for themselves. The three individuals are facing charges including conspiracy and theft by deception, NBC 10 reported. Bobbitt, McClure, and D'Amico reportedly prevented their GoFundMe donors from gaining any information that would "affect their judgment about solicited contribution" to the fundraiser. In the year since the story and fundraiser went viral, the situation has devolved into a public court battle regarding the spending of the funds. McClure and D'Amico were accused of keeping the money for themselves and preventing Bobbitt from receiving any. McClure and D'Amico have countered that they were waiting until Bobbitt was clean from drugs before giving him his share. Last August, Bobbitt sued the couple, and in September the McClure and D'Amico were expecting to both be indicted. D'Amico and McClure turned themselves in Wednesday in Burlington County. Bobbitt was reportedly arrested Wednesday night on the 1200 block of Shackamaxon Street in Philadelphia by members of the U.S. Marshalls Fugitive Task Force, on charges of being a fugitive from justice. The Burlington County Prosecutor's is scheduled to make an announcement regarding the case Thursday afternoon.